Almost as good as a masticating juicer! The Breville BJE820XL is a versatile do-it-all juicer that can juice and puree as well. This particular high-end juicer comes with two different discs – one that helps deal with soft veggies and fruits and the other that is designed for harder ingredients. Ideal for folks who prefer mixing and matching ingredients. Apples and Bananas both have varying texture and taste. It is for this reason that the Breville BJE820XL uses two separate discs. One works with bananas and softer leafy veggies helping pulverize it into a paste without losing much pulp while the other helps squish apple into soft produce and extract crystal clear juice – just the way massive juice factories work. This is an easy to operate, clean and maintain juicer that is dishwasher safe and features a large 3 inch feed chute that helps force down entire ingredients with ease. 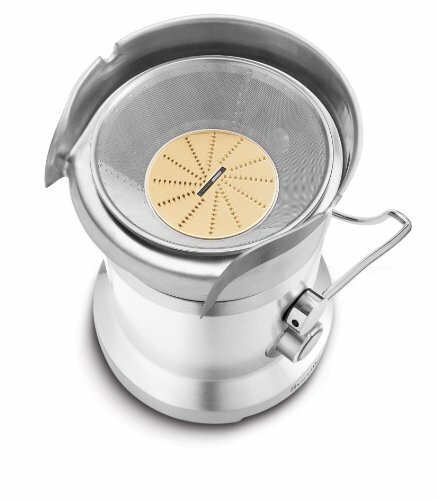 Did we mention that the BJE820XL also happens to be the top model from Breville? Quite simply speaking you cannot go wrong with the Breville BJE820XL. This may just seem as a smaller upgrade on the 800XL model from Breville but it is so much more than just that. With dual purpose design – puree and juice, using this juicer is an absolute blast. The two included discs to handle either function are easy to change and each is designed specifically to handle a specific kind of ingredient. Depending on whether it is soft and leafy ingredients or hard and crispy, change the disc and start juicing. Add to this the fact that it has 5 different speeds and you get a unit that will tackle whatever you put in it.Our impression of the BJE820XL was that of a professional juicing machine and if we were to start a mobile juicing unit, this is definitely one juicer that we would have had in our unit. Be it daily purpose juicing, onetime pureeing or helping the community with low cost juices on a hot summer day, the Breville BJE820XL is well worth the investment, albeit a little expensive. 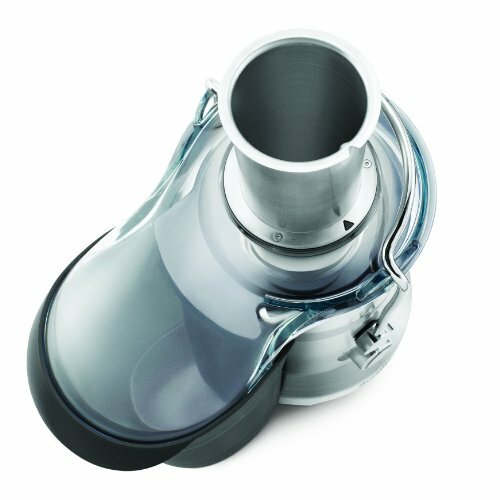 Never before has a centrifugal juicer been this easy to use. In fact, if you disregard its large footprint you will actually learn to love this beauty. Chrome finishing with every part designed to last, you really don’t have to worry about breaking or damaging anything on it. The Breville BJE820XL is super easy to use and can juice many things at once. Just because this is a large juicer doesn’t mean that it won’t cleanup easy. In fact, the metallic construction, interchangeable discs and removable pulp catcher makes the entire unit so easy to clean. You can choose to either do the cleaning between various runs or simply rinse the entire unit with water for a couple of minutes and begin a new juicing run. Being a centrifugal juicer, expect some foaming and frothing but because of the 5 electronic speeds you can actually lessen the frothing to a large extent. 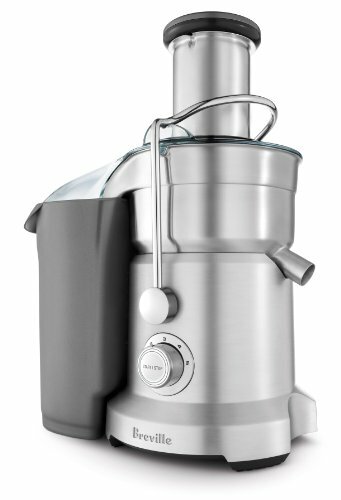 Hence, we give this Breville the highest juice quality among all centrifugal juicers. Almost as good as a masticating juicer! Yes, the Breville BJE820XL actually does produce enough juice to put a masticating juicer to the test. While the pulp isn’t completely dry, it is still as dry as it can be. 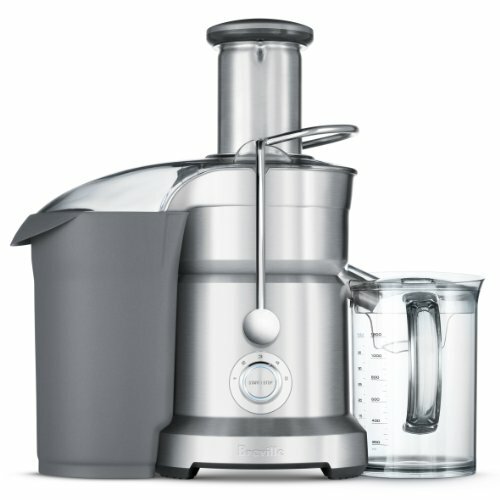 At 1200 Watt, it is impossible to find a more powerful juicer in the market. Enough power to provide 5 different speeds and maintain a consistent torque even at lower speeds – this is the Breville 820XL’s secret to success. It is loud but we felt the large motor being the only one of its kind in the market cannot be compared to any other juicer and hence automatically earns a 4 star rating. Just don’t think you can run this juicer early in the morning and expect no complaints! A strong and sturdy design with dual purpose operation, the Breville BJE820XL is the top-of-the-line juicer from Breville with the best technology in it. Great juice yield, superb quality, plenty of speeds, compatibility with soft and squishy veggies as well as hard fruits, this juicer is a dream come true for those who wished masticating juicers could operate faster and centrifugal juicers could produce juice that tasted natural. Pros: Literally nothing that it cannot handle, different discs for pureeing and juicing helps quicken up and yet retain quality and quantity. Cons: Expensive and large size makes it harder to store after use. Two different discs one for pureeing and another for juicing each designed to increase efficiency and reduce time needed for cleaning. 5 speed electronically controlled dial ranging from 6500 RPM to 13000 RPM. Comes with a large 3 inch feed chute that can take an entire apple. Is it recomendable for a little juice store?